A test train just east of Bergamot Station. •The Expo Line extension to Santa Monica will open in May, although no specific date was provided. Here’s our earlier post on more frequent train testing. The Expo Line Construction Authority has turned over the mainline tracks to Metro, but still must formally hand over the rail car maintenance facility to Metro. The moving target on the opening of the Expo Line to Santa Monica is starting to narrow a bit. Latest info: Sometime in May! •Phil also said that the Purple Line Extension’s section three — from Century City to Westwood — was accepted in a new Federal Transit Administration pilot program to help accelerate transportation projects. The FTA’s acceleration program will be retooled because of the passage in December of a new federal transportation spending bill. The FTA has said it will publish information soon about changes to the program. In the meantime, the FTA has also said they will continue to support acceleration of the project — which is good, meaning it’s on their radar — and Metro staff has said it will continue to seek ways to speed up projects. 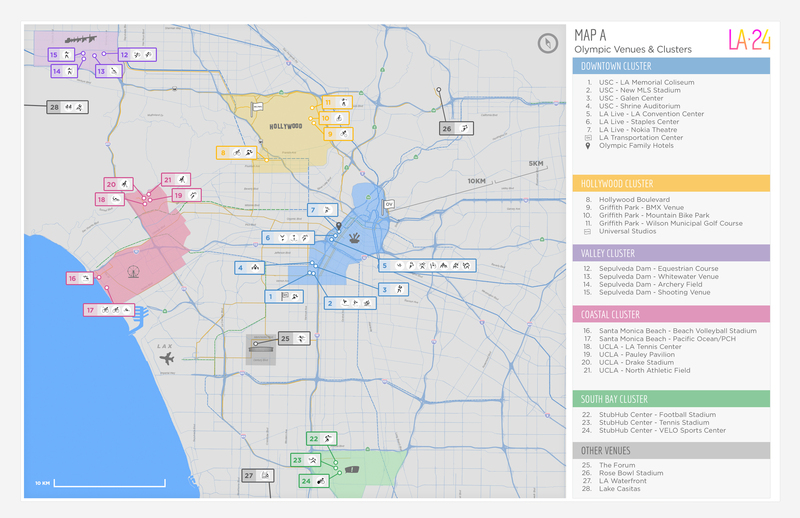 Sites proposed for athletic events as part of the 2024 Summer Olympics. Source: LA24. In a move that should surprise no one, the group bidding for the 2024 Summer Olympics has said it intends to put the athlete’s village at UCLA and the media village at USC instead of original plans to purchase a Union Pacific rail yard in DTLA, clear the site and then build a new village on it. That plan could have cost up to $2 billion, not to mention the fact that it was unclear if UP was going to sell the land. UCLA already has plenty of dorm rooms and facilities and officials were planning on holding athletic events there anyway. Does this ramp up pressure to get the Purple Line to Westwood by 2024? Perhaps. L.A. is one of four cities — joining Paris, Rome and Budapest — bidding for the Games. The winner will be selected in Sept. 2017. In the meantime, the first section of the Purple Line Extension — to Wilshire/La Cienega — is scheduled to open in late 2023. Metro is working, too, on nailing down a federal grant to help pay for the second section to Century City and getting that project underway. The LA24 press release is silent on the issue of getting the Purple Line to Westwood by 2024. That’s certainly a fair point. Juan also says that he thinks getting riders on transit will remain challenging until the cost of driving goes up (keep in mind that cost includes more than just gasoline). We’ve previously listed some of the possible reasons for ridership declines (service issues, maintenance, fare increase, fare enforcement, better economy, among others). I’d like to add one: perhaps expanding the system will better connect transit to jobs and residential neighborhoods and make transit something people are more willing to take. The Metro Board is scheduled to discuss the ridership issue at their meeting Thursday morning. The latest staff report on the issue is here. A detailed recounting of the crash last May in Philadelphia that killed eight and injured more than 200 when an Amtrak train jumped the track after entering a curve at more than twice the posted speed limit. By most accounts, the engineer was as conscientious as they come. He tested negative for drugs and alcohol and was not using his phone. The National Transportation Safety Board is expected to begin releasing its findings in February. In the meantime, there is only speculation about what caused the crash, with some suggesting that the engineer became disoriented or simply lost his bearings due to an object striking the train or perhaps because of fatigue. That said, the NTSB has said that one thing absolutely could have prevented the crash: a GPS-based system known as positive train control that would have automatically halted the train. That system wasn’t up and running at the time, due to problems with Amtrak funding and bureaucratic hassles. It now is along some stretches of the busy northeast corridor (Amtrak’s busiest corridor). Other railroads have until 2020 to get positive train control up and running, although Metrolink has already started implementing it. Metro is one of five county transportation agencies that funds Metrolink commuter rail. Metrolink shares tracks with freight trains and Amtrak. As Joe Linton points out, Measure R returns 15 percent of its revenues to local cities on a per capita basis. Some of that money — called “local return” — has been used for pedestrian and bike projects. With Metro working on a potential sales tax increase to take to voters in November, the post reminds Streetsblog readers that Streetsblog will/already is watching closely to see if there is a dedicated funding stream for walk/bike projects. Reader reaction in the comments section is interesting. Jan. 25: new Board motion calls for studying rail line to new Rams stadium in Inglewood. Jan. 21-22: transit ridership declines, why teens are driving less and seniors more, more gondola talk, active transportation and Metro construction update. 2024 is still an unacceptable date though. The construction should start as soon as possible and finish in 2018. The picture for “LA24’s plan for Olympic competitions” shows the proposed Inglewood stadium for the Rams which has nothing to do with UCLA or USC. Fixed and thanks. People: try to avoid distracted blogging. Unsafe! What difference does it make concerning R2 unless someone believes walking from the City of Santa Monica to Silverlake everyday an acceptable alternative to the total grid lock we are now experiencing. To emphasize: the federal program to accelerate is being retooled because of language in the recently-passed federal transpo bill. I think it’s good that the FTA sees this project as something that could be accelerated, but I also think that a clear acceleration strategy with funding attached has yet to emerge. Expo to Santa Monica: Fantastic news! This project marks the beginning of a major regional shift, IMO. Having once lived in Culver, the prospect of being able to get from downtown Culver to, for example, the Colorado Center in SaMo in 10-15 minutes is going to be a big deal for a lot of westside workers. Now, that being said there’s little doubt in my mind that many people will be forming their first impression of Metro’s competency as an agency and of the service that they provide. Hopefully Metro is working assiduously to try and correct a serious error that is going to result in frequencies of 1 train every 12 minutes during rush hour on Expo phase 2. If not, don’t be surprised when ridership starts dipping again after an initial bump. As to the streetsblog article, I personally would not vote for a ballot measure that did not have any active transportation funding set aside. There’s also bound to be considerably less funding set aside for rail and BRT construction than there should be. I am not keen on the idea of needing to generate 100+ billion dollars in taxes just to get 25 billion in new rail projects. Too much heat, not enough light. As far as I know, frequencies will remain at 12 minutes. One considerable issue: the Expo Line and Blue Line must share the stretch of track between Washington/Flower and 7th/Metro and trains on both lines must turn around at 7th/Metro. That constrains the total number of trains that can use the track. 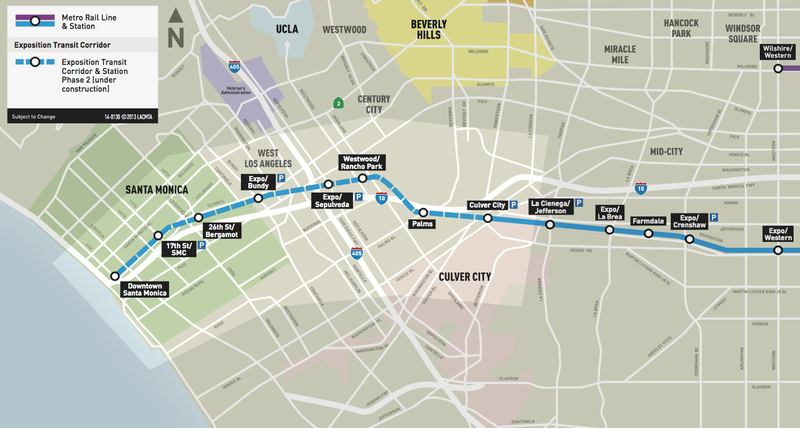 The Regional Connector will help because 7th/Metro will no longer be a dead-end station — trains will continue through downtown Los Angeles to either East Los Angeles or Azusa. As for the active transportation issue, it is not my place to say how the ballot measure money should be allocated. But I think the Streetsblog article accurately notes that this has become an issue with other groups taking a stance on it. Unless I’m mistaken, I don’t recall active transportation being as much of an issue when the Measure R spending plan was released. So that’s notable and Streetsblog was smart for noting it. We’ll see play how it plays out. We CAN do better than one train every twelve minutes. 7th/Metro doesn’t have to be the limiting factor. Consider – a northbound train leaves the shared Pico station every few minutes. This is true now and it will be true this Spring. We increase the Expo headways towards Pico station, and whenever 7/Metro is occupied, the trains stop one station early. Travelers whose trips take them through 7th/Metro will sometimes see the time they save with increased headways absorbed by the extra few minutes to transfer. In exchange, the line will gain capacity and better serve all other riders. Steve- Can you help me reconcile this (from March 17, 2015): “The report also looks at an ongoing issue that I’m sure some of you have heard about: Metro is in the process of acquiring the new light rail vehicles needed to fully operate both projects; not all the cars needed will be delivered before Metro wants to open the projects. The staff report explains how Metro plans to deal with this both during testing and once the lines are up and running. The Federal Reserve has taken heat for buying securities via TARP. What could be safer than the Fed buying public infrastructure improvement bonds from agencies like Metro since Congress, despite the new law, can’t agree or compromise on anything and will have to reach yet another and perhaps different budget agreement again in a few months. If R2 would eliminate the close to useless Bike/walk, that would be fine. 15% is way too much for the few people who would benefit, it should be no more than 5%. I was up for some urban hiking this past weekend: hoofed it from 7th/Metro to Clifton’s, then hoofed it from there to Disney Hall, making it to the pre-concert lecture with time to spare. PTC most definitely could have prevented Amtrak 188. I’d wager that decades-old ATC and even ATS systems probably could have, too, if they hadn’t been more-or-less abandoned. Vic V, It’s too bad you’ve chosen to stay anonymous. I would love to sit down with you and introduce you to the many Angelenos who choose to spend time outside. Someday, I hope, you will choose to join us. I think you’ll appreciate not having to spend five minutes looking for parking after driving only three blocks. I’ve heard that when you don’t use the sidewalks, you put yourself at serious risk for heart disease and stroke. This is a socially contagious habit; if you think only five percent of us walk outdoors, then your peer group may not be representative of the general population. I would encourage you and your friends to spend some quality time together with a walking tour of your neighborhood. Of course, given your …. conditions, you may want to walk in a single file. I’m excited for the opening of Expo to Santa Monica. The frequency is something that has been mentioned a lot, especially since we seem short of rail cars. The idea to have some terminate at Pico would not be a bad idea imo, since it is essentially a transfer point. Out of curiosity, and I never EVER see it addressed, is the right of way that heads toward the DMV east of the USC. it seems like an excellent terminus/transfer point to the busway for those that need it, or need not go downtown. It had come to mind when the decision was made NOT to tie in the Crenshaw Line to DTLA since 7th would be overburdened. It looks like it might be difficult to create a spur from the trench, but extending the tracks (or maybe even just one track) down what seems like only about 250 ft, could work amybe. I think it would alleviate congestion downtown and on trains, almost similar to how the Blue Line runs to Del Amo or Willow, and turns back. It seems to generate more frequency and alleviate platforms for those not goin downtown. That Bus terminal is nicely orphaned unfortunately, but is still a viable transfer option for those willing to make the walk to either USC station or Jefferson Station. I was thinking about similar fixes or workarounds for the downtown (street running) Silver Line stops. The congestion and delays on recent trips have been appalling, so I have resorted to transferring at Pico to/from the more predictable light rail. Too bad the Harbor Fwy transitway has not been extended through downtown in a useful way. Anyone have a link to the original plans? Also too late, but ‘fast tracking’ the 7th/Metro end of the Regional Connector construction could make room for a crossover and longer tail tracks (faster Blue/Expo turnarounds). It had too since I’d shoot myself in the foot every single day by going down fig on the Silver. The combination of motorist that are unaware or could care less about traffic patterns, and then the lack of filing for those entering and exiting 7th n Metro just make it game of marbles down there. I’d always miss my purple line by about 6 seconds (burn), because its very free range at 7th/Metro, and some people just DO-NO-CARE- that its rush hour. Bus lanes could sort this out properly. Its a good work around that has saved few minutes and gets me my transfers in the meantime. Its cool someone else sees the value too! I would but I don’t think it would pass without it. I think walking and biking are an important piece in the infrastructure puzzle. It would be stupid not to include it.